Pampered kitchen remodeling with no maintenance countertop:Cambria Ella Countertop White Cabinets Backsplash Ideas.Elegant quartz beauty and fine backsplash. Cambria Ella is a no maintenance countertop which bonds well with white cabinets and matching backsplash. 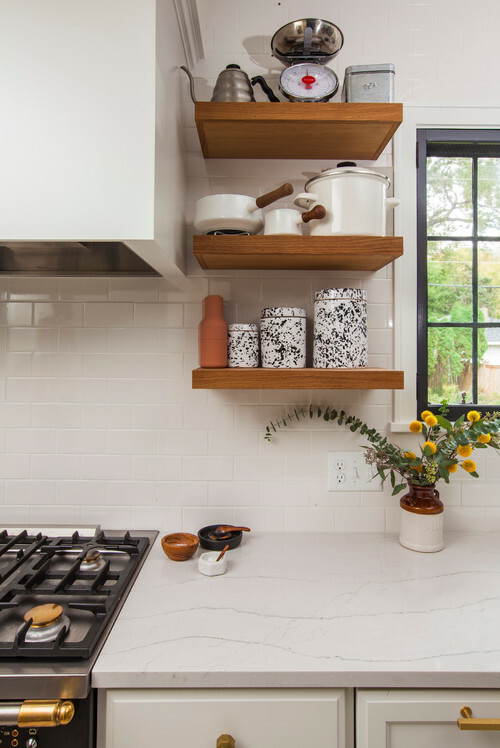 The new trend shows that, marble looking countertop goes with no maintenance countertop. After selection of the optimized countertop like Cambria Ella, backsplash selection would be a fun project. Usually marble looking white countertops would turn into excellent result in white kitchen remodeling. In Cambria Ella Countertop White Cabinets Backsplash ideas, you will find out some light brown, gray, cream and white tone backsplashes. First, I would like to touch the material and the characteristics of the backsplash. Then, I would like to talk about the color and stain of the white cabinets in this article. Cambria Ella Countertop White Cabinets Backsplash Ideas is a visual guide in kitchen remodeling and backsplash selection. The material of the backsplash can be ceramic, glass and Cambria Ella herself. The type of the backsplash tile would be subway, matchstick, and arabesque or full high backsplash. Modernized Muse: Marble Look Cambria Ella Countertop Countertop can be read if your hunger won’t be suppressed. Cambria Ella is pretty new in the market. So finding the good picture of Cambria Ella Countertop White Cabinets Backsplash ideas is limited. 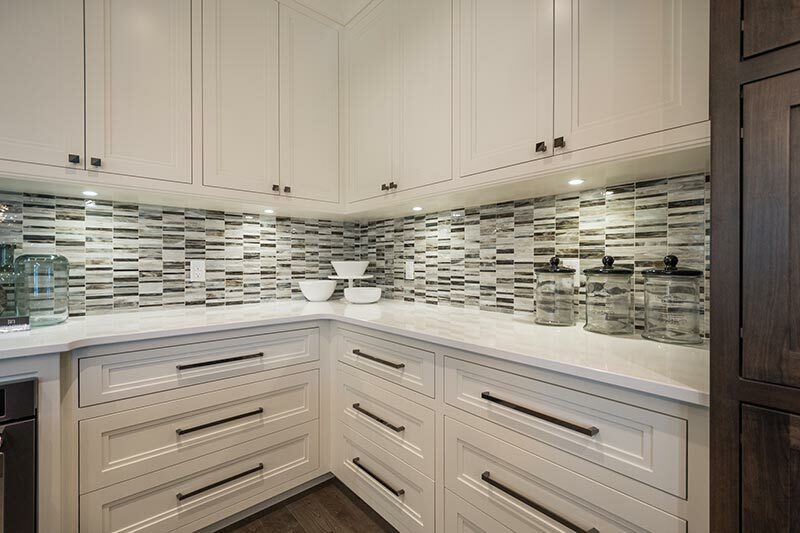 Enjoy matching backsplash with white cabinets. Since gray is new white in kitchen remodeling, I have also picked for a gray cabinets with full high Cambria Ella backsplash. Here are my picks for your review. 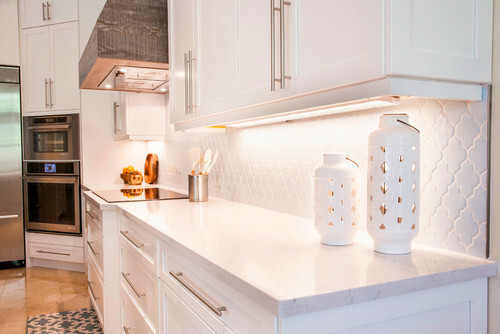 Picture Credit: Kitchen Tune-Up via Houzz and Smokey Mountain Tops via Houzz., Elegant mixture of cream ceramic subway backsplash and cream arabesque ceramic backsplash insert with warm white finish white cabinets. Please stay tuned, I will get the code and names of those backsplash. Under the glass door white cabinets lighting shows the beauty of the backsplash . All is a good example for Cambria Ella kitchen remodeling ideas. Picture Credit: Cambria Usa.,Simple is the best 🙂 White semi-gloss ceramic subway tiles, white kitchen cabinets and sophisticated Cambria Ella. This kitchen design shows the no maintenance engineered stone countertop very well. Picture Credit: Progressive Countertop., This picture comes from a “Dream Home 2015 ” project. It definitely contains all the design elements as color selection, layout, harmony in cabinets, countertop , backsplash and hardwood floor. Keen eyes designers made my day one more time. Special thanks for all detailed information as : The backsplash is from Anatolia- Bliss Baroque “Alabastro” Random Stacked Glass Mosaic. The hardwood is from Parquet Alexandra- 5” OILED Finish Ash Authentic “Graphite”. The countertops – Perimeter- Cambria White Hall with matches well with Cambria Ella for two tone countertop kitchen remodeling. For my opinion if Cambria White Hall will switch with Cambria Ella , it also wear the same the design. Cabinetry – inset cabinetry, with a double shaker door style. Colours: dove wing, which tends to have a slight cream undertone, along with cherry wood accents throughout the kitchen space , and black nickel hardware. 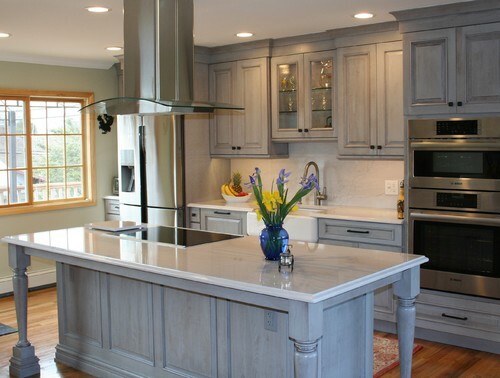 Picture Credit: South Shore Kitchen Design., This gorgeous picture proves that gray is new white in kitchen remodeling. Such a soft and lovable gray cabinet by using cherry wood in peppercorn stain finish. Cambria Ella shines like a modernized muse as a countertop, island top and full high backsplash in this kitchen. Stainless Steel Appliance is a bright addition to complete the image. Please do not hesitate to take a turn and drop a comment about Cambria Ella Countertop White Cabinets Backsplash Ideas. Thank you for your collaboration and reading my article.